For seasoned hikers and backpackers in California, it’s a yearly ritual: remembering to obtain a California Campfire Permit for the year before that first trip of the season. It’s easy to forget, and in times past it required either stopping at a ranger station on the way to the trailhead or making a special trip to an office that issued the permits. Fortunately, it’s now possible to obtain your FREE Campfire Permit from the comfort of your own home and print it out before your trip. Think of it as one less thing to forget to bring with you on your next backcountry trip. When is a California Campfire Permit required? 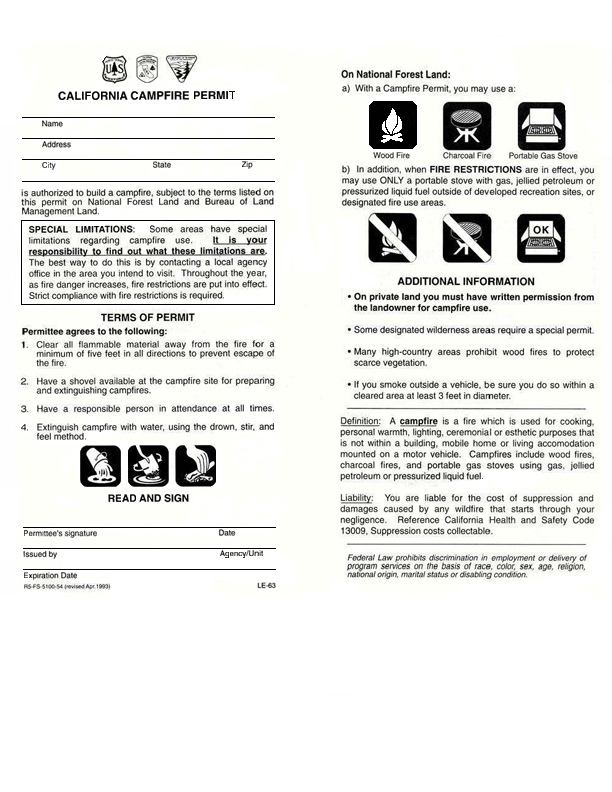 You must have a California Campfire Permit to use a stove, lantern, or campfire outside a developed campground or recreation area in California. In other words, any sustained source of open flame is going to require a permit. This includes portable backpacking stoves and propane camping lanterns. You do NOT need a permit if you’re car-camping in a developed campground. Developed campsites usually have prepared fire rings, fire pits, or grills for your convenience. 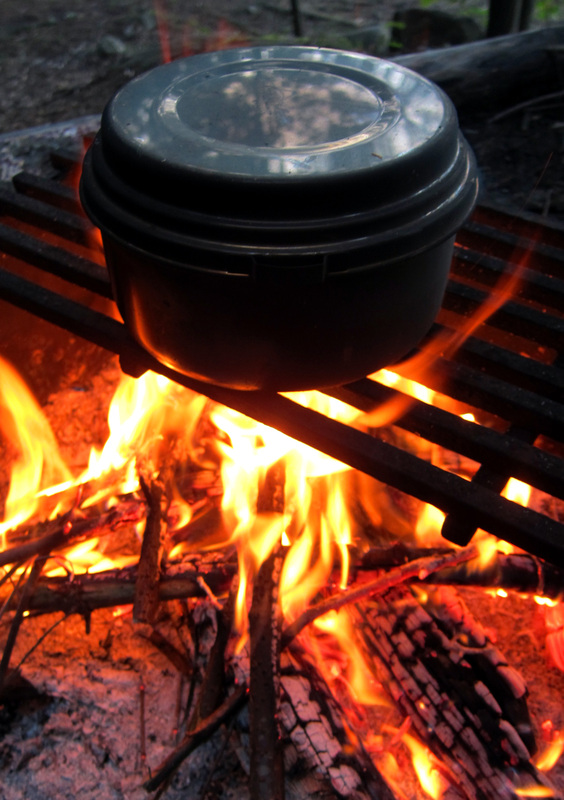 The fact that a permit is required for backpacking stoves may seem counter-intuitive, but if you’ve ever had a flare-up while lighting your stove, you’ll understand how easy it is to inadvertently start a fire. Where is the permit required? You will need the permit on both National Forest and Bureau of Land Management (BLM) lands in California. This includes designated wilderness areas. Note that many wilderness areas also required a Wilderness Permit for overnight visits. In this case, you will need both permits if you plan to camp overnight and either use a stove or build a campfire. Wilderness Permit requirements vary with each designated Wilderness Area, so be sure to check with the managing agency when planning your trips. Note that you do not need a California Campfire Permit when visiting California’s national parks, such as Yosemite or Sequoia/Kings Canyon. However, you will need a Wilderness Permit and each park has its own separate rules regarding campfires and stove use that you will need to follow. For example, Yosemite National Park prohibits wood fires (but not stoves) above 9600’ elevation due to the scarcity of fire wood and the fragile nature of the alpine plant community. Stage I. Open campfires are prohibited outside of developed campgrounds. You’ll still be able to use your backpacking stove, so this is a pretty minor inconvenience. Note that the National Forests in southern California (Angeles, San Bernardino, Cleveland, and Los Padres) routinely impose Stage I restrictions every year for the entire fire season due to the particularly high risk of fire in these areas. Stage II. Open campfires are prohibited everywhere, including in developed campgrounds. An exception may or may not apply for camping stoves. Be sure to check with the land management agency before your visit for specific restrictions and exemptions. Stage II orders are posted on National Forest and BLM websites, usually under the News or Announcements section. You can also call the appropriate ranger station or BLM office for details. Whether you obtain your permit online or in person at a ranger station or BLM office, be sure to fill out the required information and sign the permit. Note that permits are valid for the remainder of the calendar year in which they were issued. In other words, it’s best to get your permit as early in the year as possible. Extinguish campfire with water, using the drown, stir, and feel method. As with any set of rules, it’s best to apply a little common sense in applying them. For example, no ranger is going to inspect your campsite with a tape measure to make sure that you’ve cleared a perfect five foot circle around your fire. In most cases, you will be camping at an established campsite that already has a fire ring of some sort. Clear any remaining duff and you’re good to go. One item of highly flammable material that you want to keep at least five feet (if not 10-20 feet) away from an open campfire: your tent. The shovel requirement is probably the least practical, and least-obeyed of these rules. Unless you’re packing in on horseback, most people won’t bring a full-sized shovel on a backpacking trip. At the same time, it’s unlikely that you’ll actually need one – particularly if you stick to established campsites and fire rings. The requirement to have a responsible person in attendance at all times simply means that you shouldn’t leave your fire unattended. Ever. Period. This won’t present a problem if you’re just using a stove. However, if you have an open campfire, you’ll want to ensure that it’s completely out before you turn in for the night. How exactly do you make sure that your fire is completely out? Why, using the drown, stir, and feel method, of course. Only water (and lots of it) can ensure that your fire is really extinguished. In other words, covering your fire with dirt (presumably using that shovel that you’re supposed to be carrying) won’t cut it. Pour as much water as you can onto the fire, then stir the ashes to dig up any buried embers that are still smoldering. Pour some more water, then repeat until the fire site is cold to the touch. You’ll be asked to complete a simple, four-question quiz, but the answers are on the website and they’ve even added a “cheat mode” to make it really easy. Remember that the real purpose of the fire permit requirement is to educate visitors to the public lands about common sense fire safety precautions that you may or may not already be aware of. Complete the quiz, and you’ll be able to download your permit in PDF format. Print a copy, fill it out and sign it, and then carry it in your wallet or backpack. Since the permit is good for the entire calendar year, I recommend that you keep an electronic copy of the PDF file in case you lose your printed copy. UPDATE: Los Padres National Forest now has online campfire permits also. Their web page includes information about the permit and a link to a PDF version of a blank permit. No test required! There is also a link to current fire restrictions on the Los Padres. This entry was posted in Techniques and tagged California campfire permits, campfire permits, permits, techniques. Bookmark the permalink. I am sorry, but your comment, "Only water (and lots of it) can ensure that your fire is really extinguished." is simply NOT true. You can easily put out a fire effectively without wasting water (esp. if your water is limited). Spread the coals out (safely mind you) and start stomping. A little time, a lot of air, and a bit of dirt will make it safely extinguished and safe to the touch (aka – safe enough to NOT start a fire) in a very short time. The KEY is to actually touch it all. Don't assume it is all the same temp and safe to leave. Check it all by hand. Be effective. Be safe.